[Via Satellite 10-28-13] International Launch Services (ILS), successfully carried the Sirius FM 6 satellite, built by SSL, into orbit on an ILS Proton for Sirius XM Radio. The ILS Proton Breeze M vehicle launched from Pad 39 at the Baikonur Cosmodrome at 00:09 Oct. 26 local time (18:09 GMT and 14:09 EDT on Oct. 25). The first three stages of the Proton used a standard ascent profile to place the orbital unit (Breeze M upper stage and the Sirius FM-6 satellite) into a sub-orbital trajectory. From this point in the mission, the Breeze M performed planned mission maneuvers to advance the orbital unit first to a circular parking orbit, then to an intermediate orbit, followed by a transfer orbit, and finally to a geostationary transfer orbit. Separation of the Sirius FM 6 satellite occurred approximately 9 hours and 11 minutes after liftoff. The satellite, weighing over 6 metric tons, was built on the SSL 1300 platform. 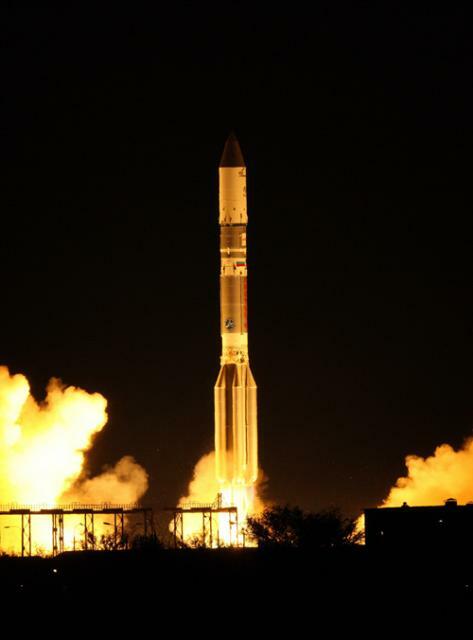 This was the sixth satellite launched by ILS Proton for SiriusXM and the 27th SSL 1300 satellite launched. Sirius FM 6 has an X-band uplink transponder and an S-band downlink transponder to deliver digital audio radio service. With approximately 20 Kw end-of-life power and an anticipated service life of 15 years, the Sirius FM 6 satellite is one of the most powerful satellites built today. The final orbital location for the satellite is 116.15 degrees west longitude.